Could tipping baristas become the norm? Starbucks has modified its mobile phone app so that US customers can add tips for baristas to their bill. Is it normal to tip in coffee shops in the US - and could it catch on in the UK, asks Tom Geoghegan? The old distinction between table service that we tip and counter service that we don't disappeared 10-20 years ago, says John McCarty, a business professor at The College of New Jersey, who co-authored a study on tipping for the Association of Consumer Research. Jars for tips appeared in small sandwich shops first, about two decades ago, then spread to chain coffee shops like Starbucks, he says. Nowadays, lots of coffee customers in the US tip although it's not yet as widespread as it is in restaurants. "Many people tip automatically and don't think through how much it affects the quality of service they get, or the rationality of it," says McCarty. So while a waiter in a top restaurant can greatly improve your dining experience over two hours, or sour it, it's harder to see how someone making your coffee can exercise the same influence. Nonetheless, McCarty himself tips 20% at his local Dunkin' Donuts. The size of tips has increased and the list of those who expect them is growing also, in recent years joined by staff in takeaways. Meanwhile, tip jars have proliferated to such an extent you may be confronted by one where you receive your sandwich and another one a few feet away where you pay for it. 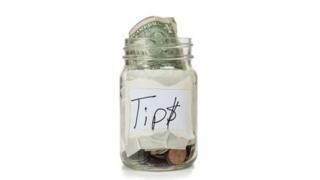 Should tips be banned in restaurants? Tipping for coffee is now more the norm than the exception, says Martin O'Neill, head of nutrition and dietetics at Auburn University, Alabama. He believes baristas in his local Mama Mocha's earn their tips due to their talent and exceptional service. "These people work very hard and putting a bit of extra cash into their pockets is not a bad thing," he says. But unlike many table waiters, baristas at a firm like Starbucks earn above the federal minimum wage. One Starbucks barista in Wisconsin told the Toronto Globe that nearly all customers gave tips, providing an extra $1.50-$2 to her hourly pay of $9.05. Despite the fact that many British Starbucks counters do have jars for tips, a Starbucks spokeswoman said there were currently no plans to bring digital tipping to the UK because fewer customers leave tips. Tipping is generally viewed with some anxiety and confusion by British visitors to the US - ironic, given that it travelled to the US from Europe in the late 1800s. British etiquette expert Simon Fanshawe can't see it catching on. "For counter service, I can't quite see the rationale," he says. "I think it would be regarded by the British, in a rather snobby way, as a bit too American."